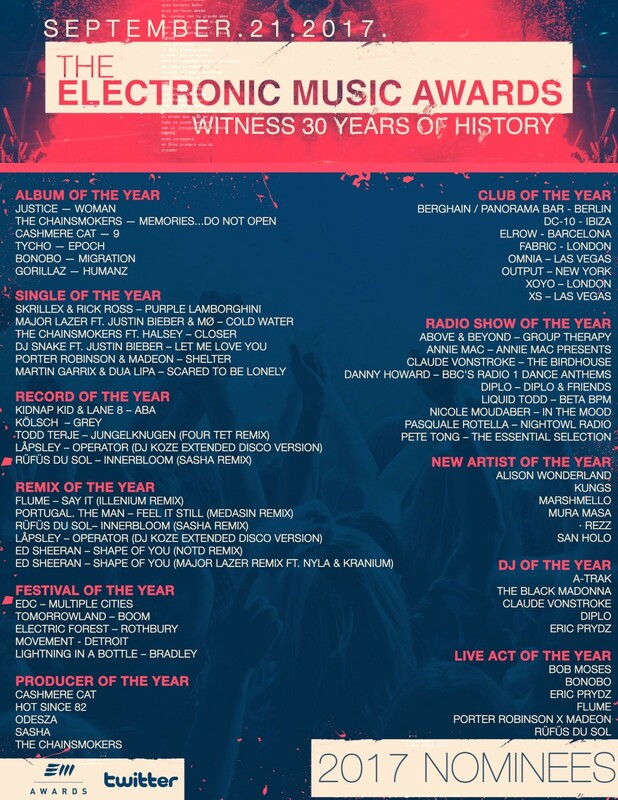 The inaugural Electronic Music Awards (EMAs) have revealed its 11 categories and respective nominees. The Chainsmokers, Sasha, Diplo, Porter Robinson and Rüfüs Du Sol are among those with multiple nominations. Celebrating the community’s best producers, DJs, live acts, festivals, clubs and more, the EMAs have also given nods to The Black Madonna, Justice, Martin Garrix, Major Lazer, Movement, Berghain, and Annie Mac. The EMAs, which are co-produced by Paul Oakenfold and the Hunt & Crest entertainment company, are set to stream live via Twitter from downtown Los Angeles on 21st September. The event is a culmination of 30 years of electronic music history. Find the complete list of categories and nominees below. Revisit DJ Mag’s Best of North America Awards here.